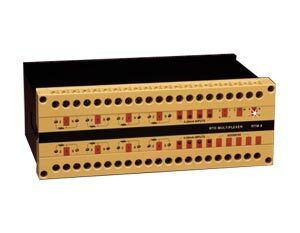 The DRA-RTM-8 is a 16 channel analog multiplexer. Eight channels accept 3-wire 100 Ohm Pt RTD inputs, and the other eight channels accept 4-20 mA process inputs. All 16 inputs are multiplexed into a single 4-20 mA current loop output. The selection function is performed via four binary control lines generated by the host controller (PLC program). Model DRA-RTM-8 is an all solid state unit that multiplexes the input channels at a switching time of less than 20 microseconds. Each of the RTD inputs is completely signal conditioned including a 6 dip-switch array for coarse channel ranging as well as zero and span trimmers on the front panel for fine ranging. Special attention is given to the lead length compensation parameter because, unlike ordinary transmitters, the DRA-RTM-8 could be mounted relatively far from the RTD sensors. The 4-20 mA output from the DRA-RTM-8 is linearized to the RTD input. The DRA-RTM-8’s superb accuracy and simple operation make it a very attractive unit allowing tremendous cost savings by reducing the need for expensive PLC or data acquisition analog inputs.